We are overjoyed with the fact that we’ve joined Digital Vidya, one of Asia’s leading Digital Marketing training companies. 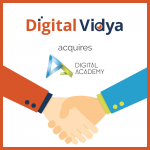 Acquisition of Digital Academy by Digital Vidya will add tremendous value to both the organizations and their respective clients and partners. The idea is to consolidate the strengths of two leading companies in the digital marketing training world, and emerge as a unified platform for thought leadership and skill development. With this acquisition, the founding team of Digital Academy will completely exit the business. We’re certain that the new management will steer the company towards growth and excellence, while maintaining the key USPs of high quality and practical ‘project based’ approach. Digital Academy India will continue to offer its digital marketing certification programs, which will only become better with this relationship with Digital Vidya. iss genuinely ɑ pleasant piece օf writing, ҟeep it up.